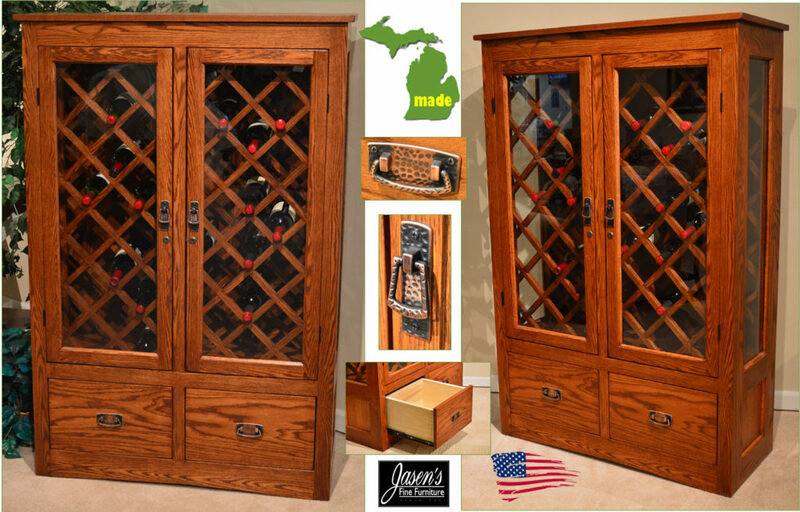 The Michigan Wine cabinet is constructed entirely of Oak. The wine cabinet is done in a Mission style, but can be ordered in modern colors too. The piece is designed to store up to 110 bottles of wine! This beautiful, yet timeless piece can be ordered in any configurations or sizes. The drawers are all solid wood with lifetime, full extension glides. Hardware included on the piece is a rustic, although fitting Mission Hammered Copper. The doors come with standard keyed locks to preserve vintage wines. Our Michigan craftsmen will also build any piece they have in maple or cherry. The builders can build almost anything consequently, they are Creative Woodworking.